In the past, the solution to replace a missing tooth was either a bridge or a denture. Often, however, these restorations did not adequately replace the missing tooth in function or appearance. Dentures and bridges can slip or break. More importantly, neither stops the bone loss that occurs when a tooth is missing. When a tooth is extracted or lost due to decay or injury, the bone that held the tooth in the jaw is no longer stimulated. When that happens, the bone stops growing and is resorbed into the body. The teeth surrounding the missing tooth begin to shift into the empty space, causing misalignment of neighboring teeth. This, in turn, leads to greater chances of tooth decay and gum disease. Implants, on the other hand, are the most modern method of replacing missing teeth. Miami dental implants dentist, Dr. Jaskiel and Dr Berkowitz, place a titanium post into the jaw bone where the original tooth used to be. This post acts as the tooth root and keeps the bone and soft tissues stimulated. An abutment is attached to the top of the post, and a crown is then secured to the abutment. The result is a very strong, natural looking false tooth that can last a lifetime. It also can withstand the normal chewing actions of natural teeth (you can eat anything! ), and they don’t slip. For the simple solution to missing teeth at, look no further than Brickell Avenue Dentistry, where you will find the best dental implants Miami has available in treatment and quality. Most people can get a implant without any problems. Miami dental implants dentist Dr. Jaskiel & Dr Berkowitz, will conduct a very thorough examination to be sure you are a candidate. Sometimes a person does not have enough bone to hold an implant properly and may need a bone graft or bone augmentation prior to placing the implant. More rarely, a medical condition may prevent someone from undergoing the implant procedure. If you are healthy enough to undertake a tooth extraction, you most likely will easily be able to receive an implant. WHAT SHOULD I EXPECT WITH MY DENTAL IMPLANT PROCEDURE? Examination to determine if the bone in the jaw is sufficient. If so, a titanium post is inserted into the jaw bone. The post is then allowed to integrate with the surrounding bone, a process called osseointegration. This can take 3-6 months. Once osseointegration is complete, an abutment will be placed on top of the post. This abutment will protrude above the gum line. A temporary crown that matches your surrounding teeth will then be attached to the abutment. A final, custom crown made in a lab will take the place of the temporary crown. It is cemented to the abutment. This final crown, made of high-grade porcelain, will look and act just like a natural tooth. Now you have a strong, beautiful tooth replacement that will last a lifetime! You will be delighted with your implant for many reasons, including the ease of care. You take care of an implant tooth the same way you would your natural teeth. You can brush and floss it at home and, of course, get routine cleanings done by our professional hygienists. You want to keep the implant from accumulating bacteria, which would open the door to gum disease. As with any tooth, gum disease can begin to destroy bone if not handled. Dr. Jaskiel and his staff are dedicated to providing every patient the highest quality dental care possible. His diligent and careful mastery of the dental arts enable him to provide the best dental implants Miami has to offer. The entire staff works hard to make sure you are comfortable during any procedure, and their caring chairside manner will help you relax. To find out more about dental implants at Brickell Avenue Dentistry, use our online appointment form or call us at (305) 653-2231. Get your dental implants in Miami and smile confidently. yellow thick layer which is the PRF layer. What is PRF or Platelet Rich Fibrin? The PRF Layer is a yellow and thick jello-like biologic material derived from spinning patient blood in a centrifuge at 2700RPM for 13 minutes. PRF is a great service for any Biological Dentist doing oral surgeon services. The PRF layer is rich in fibrin, platelets white blood cells and bone growth factors. PRF is a much better alternative to sending a tooth removal patient home with an unfilled bony extraction socket or implant site. PRF is used in dental surgical sites such as wisdom teeth extraction and dental implant surgical sites. 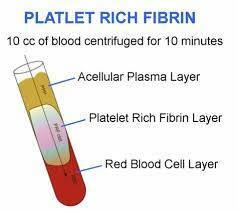 Why PRF and how does Platelet Rich Fibrin Work? During Oral surgery, the patients jaw bone is exposed. In bone there is very little blood supply as compared to other tissues in the human body. In areas where there is less blood, the body has less ability to heal quickly and less defense against infection. At Natural Dentist Associates, we place PRF into tooth extraction sites and implant sites. For example, when a dental extraction is performed, we will place the Platelet Rich Fibrin into the tooth extraction site. In the absence of the PRF, dental extractions sites are commonly left to heal open to the oral cavity. During tooth extraction site healing, saliva, bacteria and other contaminants are free to pour down into the jaw bone. When PRF is placed into the extraction site, the PRF protects the site from infection and enriches the area with proteins that accelerate healing. In sites where implants are placed, the PRF occupies the space between the extraction site and the dental implant. Placement of PRF in dental implant sites decreases implant healing time and decreases the chance for dental implant failure.